Here at Wedding Horseshoes, we make lots of gifts for Scottish brides because we are able to offer a wide range of family tartans to decorate our blacksmith-made lucky horseshoes. We have many popular tartans in stock but are able to source hundreds more from our suppliers – just get in touch to request your exact tartan. We know how important it is for couples to incorporate ancient customs into their special day, so we have pulled together five famous lucky traditions at Scottish weddings. 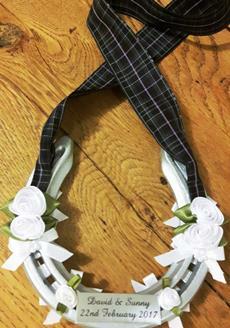 Brides in Scotland have long carried a horseshoe in their bouquet for good luck. It was held open side up to catch the luck. In some areas the bride would have a silver horseshoe sewn into the hem of her wedding dress. Other brides would have the ring bearer carry a decorated horseshoe, with ribbons to tie the wedding rings in place. Often it is a gift for the bride presented by her flower girl. Horseshoes and blacksmiths have a special place in Scottish wedding history. Gretna Green Famous Blacksmiths Shop is where couples have been tying the knot since 1754. It became famous as a spot where an eloping couple could get married just over the border from England to take advantage of Scotland’s more lenient marriage laws. In England you couldn’t marry under the age of 21. You can still say your vows over the original anvil used by the ‘Blacksmith Priest’ when presiding over clandestine unions. The ‘wedding scramble’, or warsel, is still a favourite tradition in many parts of Scotland. As the bride steps into the car, her father throws a handful of coins for the children at the wedding to collect. It is believed to bring the couple financial good luck. In the Scottish borders, people believed that placing a sprig of white heather within the bride’s bouquet would bring good luck and happiness to the marriage. White heather seems to have been associated with success in battle; in 1544 Clan Ranald attributed a victory to the fact they had worn white heather in their bonnets, and Cluny of Clan MacPherson attributed his escape after Culloden to the fact that searchers had overlooked him whilst he slept on a patch of white heather. This custom might take a bit of preparation in the gym. This tradition required the bridegroom to carry a creel (a large basket) filled with heavy stones all around the village until his bride came out of her house and gave him a kiss. A bit of a shock for the unwary – and unprepared – bridegroom. The luckenbooth brooch is a Scottish love token, often made of silver and sometimes engraved or encrusted with jewels. The brooch has two hearts intertwined with a crown on top and got its name from the luckenbooths near St Giles Church in Edinburgh where silversmiths and jewellers had their booths. It was exchanged by a couple when they became engaged, symbolising their promise to marry. After the wedding it is considered lucky to pin the brooch to the blanket of the couple’s first child. The ‘wedding sark’ is the traditional name given to the shirt worn by the groom which is given to him by the bride. The groom pays for the wedding dress in return. Clocks are traditionally given to the couple by the best man, while the maid of honour gives them a tea set. Why are horseshoes considered lucky? © WeddingHorseshoes.co.uk 2015 Onwards. All rights reserved.